Screening employees for musculoskeletal problems can help detect issues and educate employees about how to reduce the impact. A case study shows there are bottom-line benefits for employers too. Musculoskeletal (MSK) screening packages are designed to proactively screen employees and identify predisposing factors that could contribute to musculoskeletal disorders and general health conditions. This approach aims to engage the workforce into taking responsibility for their own health, and helps to reduce the potential impact on employee wellbeing and work ability. referral to in-house services (if available). To demonstrate the effectiveness of screening, Connect Health ran a pilot study with a large public-sector organisation in 2016. The aim of the pilot was to assist in the reduction of musculoskeletal disorders (MSDs), identify any existing MSDs or potential areas of concern, educate the workforce in relation to good working practices and postures, give specific work-related functional exercises, and finally to give encouragement to the workforce to gain and maintain their general fitness levels. The study consisted of 32 staff members who had physically demanding job roles, and were chosen from a larger pool of workers due to the unusually high rate of MSK absence in their shift pattern. a final 30-minute assessment after three months. The pre-screening questionnaire was completed by all employees, and was used to identify any pre-existing MSK pain or disorders. It also covered how long they had been in their role; what previous treatment they had undertaken; and whether or not any injuries were having an impact on their role at work. Out of the 32, 28 reported a previous MSK dysfunction, while 19 reported a current problem, with 11 of those saying it was affecting their ability to do their job. Only two were undergoing any treatment. The initial assessment consisted of a structured, full body evaluation, and it was found that only one of the 32 participants managed to get through the assessment without any abnormalities being detected. The most common areas for MSDs were identified as the neck (17); foot or ankle (14); and hamstrings (13); with a further six different areas causing issues for two or more people. From this assessment, 29 people were issued with a bespoke exercise plan; 15 with specific manual handling advice; five with ergonomic advice; and 11 were given general lifestyle advice. At the one-month review appointment, which consisted of a shorter review of past issues, along with a modification of exercise plans where appropriate, seven people (22%) reported being asymptomatic, which was a positive result. Twelve cases of MSDs were reported, which was a reduction of 87% from the initial assessments. These also included three new conditions that had occurred during the pilot period. Only one person reported their injury was an issue that affected whether or not they could fulfil their job role, compared with 11 at initial assessment. Seventeen people (59%) reported being completely asymptomatic. The remaining MSDs were largely related to the lower back and core stability, which can take longer to achieve full a resolution, with a structured manual handling training programme. 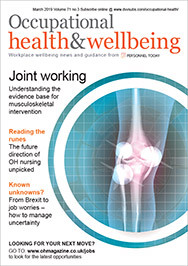 The average time lost for an MSK disorder in the UK is 15 days, meaning that screening can have a considerable return on investment by getting employees back to work, but also working at full productivity. The pilot study demonstrated a return on investment of 15:1, meaning a £15 saving to the business for every £1 spent. While any pilot study is subject to caveats, in this case it can be clearly seen that prevention and intervention works. Both subjective and objective analysis of the results found that the prescribed rehabilitation programme improved both musculoskeletal pain and dysfunction over the three-month trial period, while the improved general health and fitness of the employees should enhance their long-term ability to work, improving productivity and reducing presenteeism and the costs of absence. For more information on this pilot study or on musculoskeletal screening in the workplace, contact Kathryn Gough at Connect Health: kathryngough@connecthealth.co.uk.